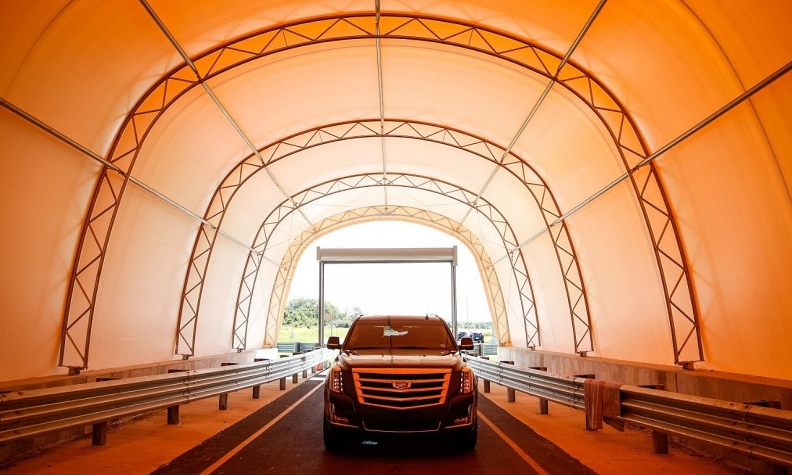 A tunnel at GM's new testing facility allows engineers to simulate toll booths and other structures that require special attention when developing active safety technologies.The new testing facility is located at GM's longtime proving ground in Milford, Mich.
DETROIT -- General Motors is introducing a pedestrian-avoidance system on the redesigned 2016 Chevrolet Malibu, the latest example of active-safety features proliferating on mainstream vehicles. The system uses a camera positioned behind the windshield that scans for pedestrians and will alert the driver of a pending collision, applying the brakes automatically at the last second to avoid an impact or reduce its severity. Unlike other crash-avoidance setups, this one uses only a camera and software, rather than coupling a camera or sensors with radar. That helps keep the cost down to a few hundred dollars, which allows GM to offer the technology on lower-priced vehicles. "The camera technology allows us to put it on more vehicles,” John Capp, GM's director of global vehicle safety, said in an interview at GM's proving grounds here. “We can offer technologies that heretofore you had to step up to a radar package that maybe not all customers would want." GM officials would not say how the feature will be priced. More details are expected in coming months on the safety packages that will be offered on the next-gen Malibu, which goes on sale in the fourth quarter. The pedestrian-braking feature also will be offered on the Cadillac CT6 sedan that goes on sale by early 2016. 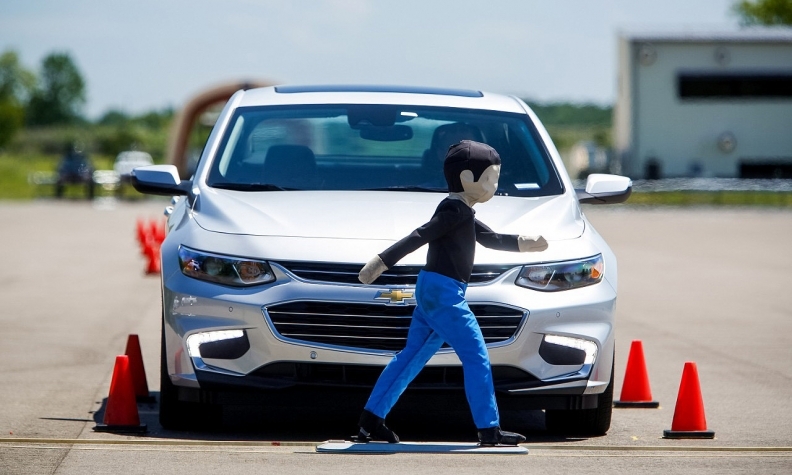 Front pedestrian braking, a new active safety technology available on the 2016 Chevrolet Malibu and 2016 Cadillac CT6, being demonstrated at GM's safety test area in Michigan on Friday. GM engineers demonstrated the technology for journalists using a '16 Malibu and an automated dummy of an 8-year-old boy. In multiple tests, the car screeched to a halt automatically from a speed of about 15 mph when the dummy darted across its path. Engineers said they are working to upgrade the system so that it can also avoid or mitigate bicycle collisions, but they haven't yet perfected that capability. The same camera will be used to offer another feature that GM calls "city speed automatic front braking," which applies the brakes to lessen the impact of rear-end collisions for example, or avoid it altogether at slow speeds. GM did not say on what vehicles it would be offered. The camera-based system is not as effective as ones that also use radar. It can mitigate but won't avoid crashes at speeds of 20 to 40 mph, and may not be of much use in collisions at higher speeds. The camera is the same device that GM has used for a few years on many of its cars to deploy lane-departure warnings and forward-collisions alerts. Its low cost allows GM to equip even its least expensive vehicle, the Chevy Spark, with those active-safety features. GM conducted the demonstration at a new $14 million facility here dedicated to the development and testing of active safety systems. GM said it will offer 22 active safety systems across its brands for the 2016 model year. GM's global product chief, Mark Reuss, told reporters that the systems being developed here are the building blocks for future autonomous vehicles that can avoid crashes. "If we provide mobility solutions that don't provide better safety, then I think we've failed," Reuss said. "What you see here, technology-wise, is the road to autonomous" driving, he said. "I think you'll see, in 2020, cars that really focus on accidence avoidance first."